The Hugh Wade of the years 1929-1935 is the one I first encountered a few months ago. It is Hugh Wade of The Blue Lantern and The Blue Angel, of the jaunty cap and Bright Young parties, the “naughty boy” who symbolised Elizabeth Ponsonby’s fall from, if not exactly grace then social prominence and of course the Hugh Wade who gave evidence at Elvira’s trial. On the surface Hugh seems to have abandoned composing for performing (and partying).As far as I can see, there is only one copyrighted tune to his name in the whole six years. It’s a good one though. 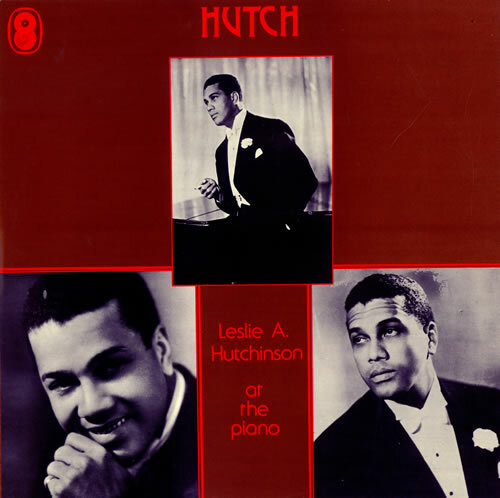 The Layton and Johnstone version is of most interest to me as not only were they prolific recording artists but they were very much part of the “Smart Set” and its fascination with sophisticated black artists. 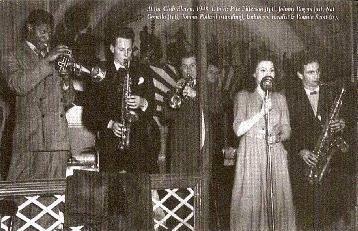 I have posted about Turner Layton on more than one occasion (see https://elvirabarney.wordpress.com/2012/03/19/another-party-in-glebe-place/ ) and think he ought to be given the same prominence as Hutch in terms of 1930s musical culture. The most widely circulated version would have been Henry Hall’s. His BBC Orchestra was heard in every home in England. Several generations of children grew up listing to “Teddy Bear’s Picnic” but among the novelty music there were many romantic, if slightly formal, arrangements of the popular music of the day. 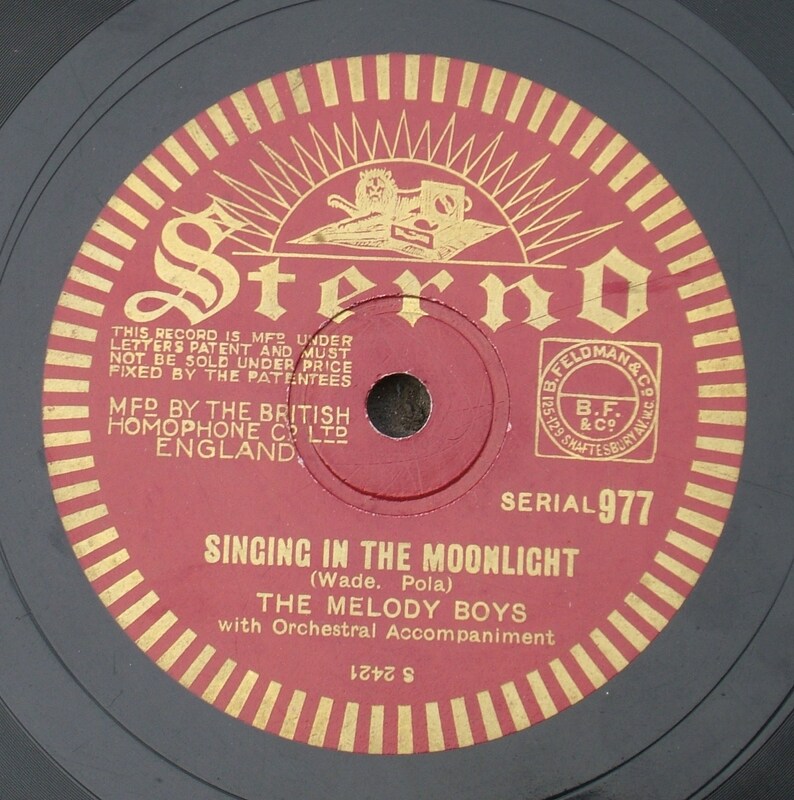 Each weekday at 5.15pm a large section of the British public tuned into listen.”Singing In The Moonlight” is the title of one retrospective Hall CD and is the Wade composition most readily available these days. Hugh’s co-writer was Edward “Eddie” Pola. 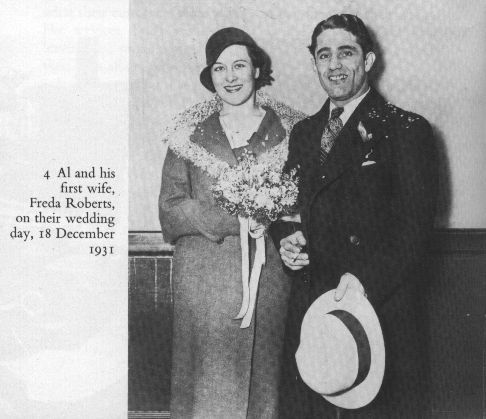 An American, he would later achieve great success in the States working with George Wyle (they wrote “It’s The Most Wonderful Time of the Year”). He was in England throughout the 1930s and acted in films as well as recording (by the standards of the day) slightly risque songs such as “I Want to Be A Nudist” and “The Gigolo’s Wedding“. He also performed comic monologues parodying various musical genres. There are some Pathe short films online – but I can’t get any sound on them. Most of Hugh’s time was taken up with the long residency at the Blue Lantern. This is the Hugh whose fans included Tom Driberg and Frederick Ashton and who Jocelyn Brooke, wittily but rather acerbically, turns into a symbol of the “louche” set. However, I think there were other projects. Hugh had been providing music for revues since 1928 (“Quicksilver” and “Miss 1928”) and continued to do so. It seems he collaborated with Billy Milton’s partner Billy Noble at some point. 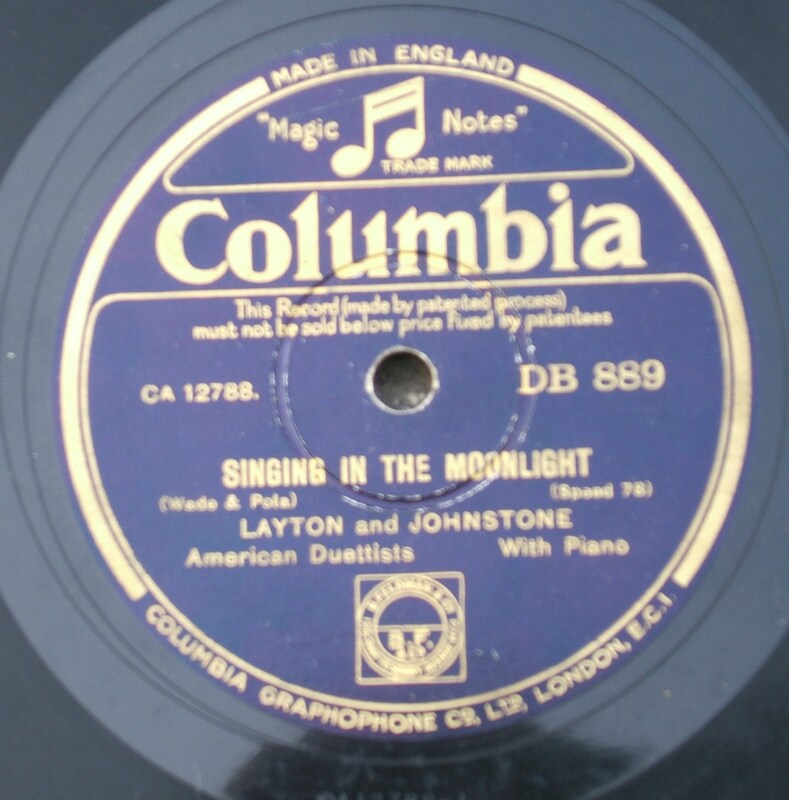 He also wrote music for Douglas Byng and may have accompanied him in his nightclub act and possibly on record. 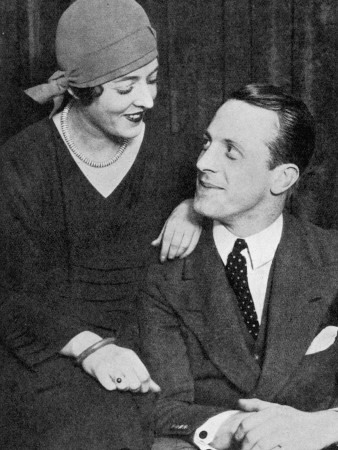 Wade composed a score for Byng’s lyrics in a one-off revue that also starred Ernest Thesiger. 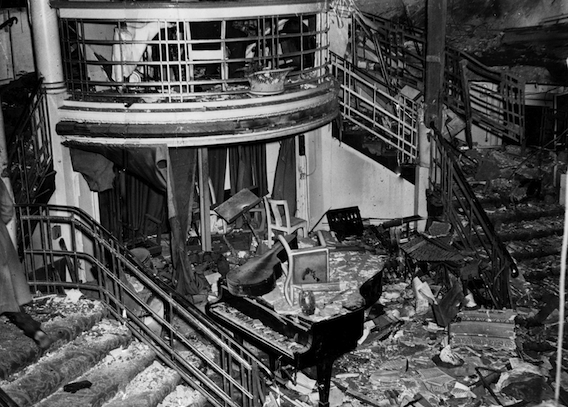 I think it was probably “Past Bedtime”, a charity cabaret ball at the Savoy Hotel. 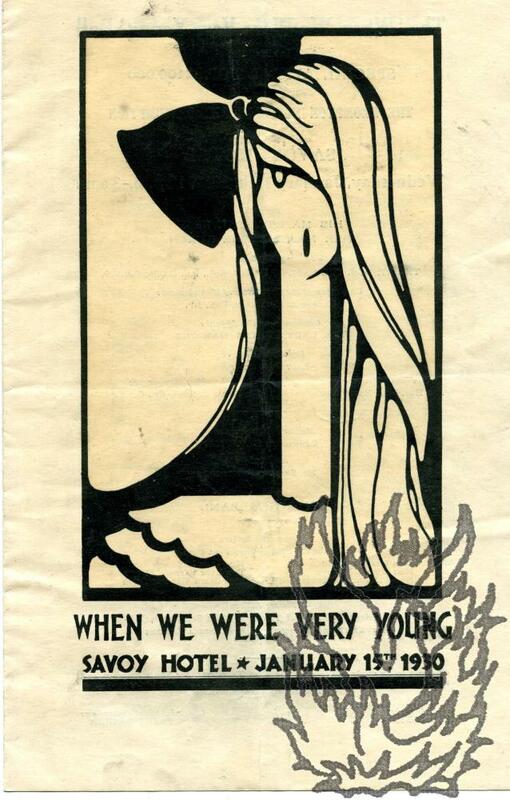 Attendees were invited to “Come as we were when we were very young”, another example of that fondness for infantilism among some elements of the Bright Young Things. Hugh had other residencies apart from the Blue Lantern and Blue Angel. A notice in Flight International 1932 reads “Every Sunday evening a dance will be held, and everybody is cordially invited ; arrangements have been made for Mr. Hugh Wade to be at the piano until further notice”. This is likely to have been at the Brooklands Aero Club or the Stag Lane dance pavilion, both popular with motor car and plane enthusiasts, but I haven’t been able to pinpoint the venue as yet. 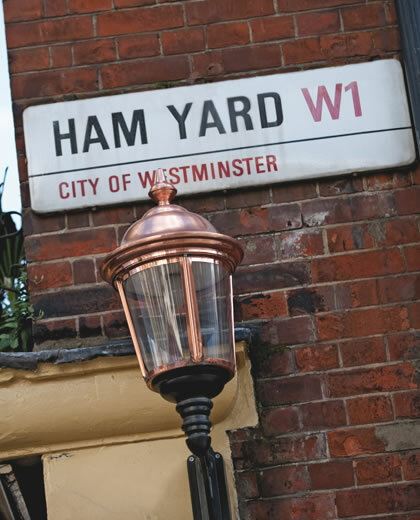 The Royal Aero Club which published Flight International also met at the Hambone in Ham Yard (next to the Blue Lantern) so it might have been there. So it was a rather fuller professional life than one copyrighted song might indicate. On to 1936 and two prestigious projects. I hope this doesn’t mean that I am going to have to wade through the entire oeuvre of Dame Barbara Cartland but if this is not a description of somewhere like the Blue Lantern then I’ll eat my Green Hat. “We went to several clubs and then on to the most extraordinary place called the Blue Lamp Club, which was all done up with red, and steel chairs, against white concrete walls. The only decoration on the walls was a huge fresco of a naked man and a woman, and everyone kept saying how thrilling it was to be there, and how they ought not to have come. I could not quite see why, for it seemed to me frightfully dull. The band was good, but the women were all in tweedish clothes, mostly with berets on very straight hair, and hardly made up at all. They seemed to take no interest in the men, who were quite amusing, for they had absolutely fantastic clothes – red or black shirts, and yellow spotted ties. If anyone asks you how the term “Gay” has mutated over the years, I suggest you show them this marvel of misapprehension. The above passage comes from the exquisitely, if, in the light of what we now know about the saintly Barbara, inaccurately entitled “A Virgin in Mayfair” which appeared in 1932, the year of Elvira’s trouble with the law. It is as badly written as prejudgement would lead you to suspect but does contain an array of detail and commentary. both incidental and accidental, which is highly enlightening. 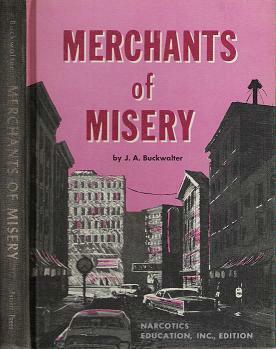 The novel tells of the journey of a young debutante through London society sometime in the mid-Twenties. It makes a sharp distinction between Mayfair (fun but essentially respectable) and Chelsea (louche and sinister). The heroine is at home at The Embassy, Quaglinos and the Cafe De Paris, but distinctly ill-at-ease at Bohemian parties in Chelsea or in after-hours clubs off Piccadilly. Elvira’s “sin” was that, as with many of her circle, she made no such distinction. 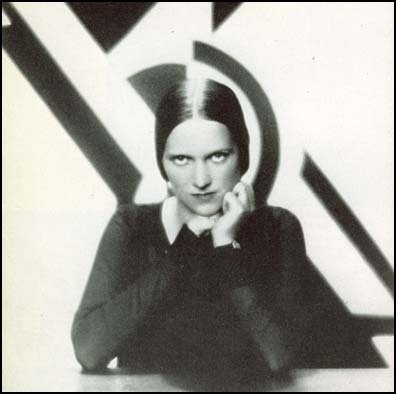 Cartland, who served her time as a Gossip Columnist and whose early and books plays had been considered “borderline” immoral, knew something of the world she wrote about in these years. Whether that justifies her prefatory comments to the 1976 reissue -” The Night Clubs and most of the people in the story were real and the atmosphere is correct.” – is open to question. Modesty, other than that of the sexual variety, was never her strong point. As Cartland’s Deb era was the early 20s, this would seem to discount the Blue Lantern as the inspiration for the “Blue Lamp” night-club. 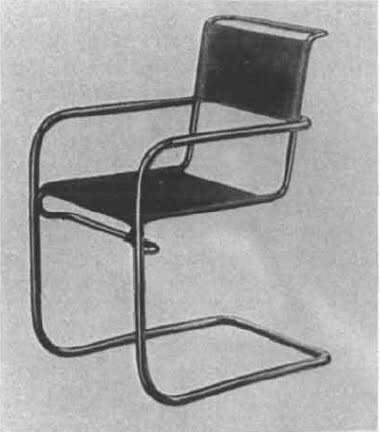 However “Quags” only got going in 1929, so she seems to have kept in touch with later developments and, yet again, those steel furnishings point towards the end of the decade. The description of the club’s regulars, though seemingly devoid of insight, corresponds pretty well with the more knowing reminiscences of Jocelyn Brooke and Anthony Powell. I’ll delve into other portions of the book later but for now I leave you to speculate as to who the real-life models of those be-tweeded and beret wearing women might have been and which young men on the night-club circuit wore such flamboyant outfits. I am currently reading, with much enjoyment, Julie Kavanagh’s biography of the dancer and choreographer, Frederick Ashton. 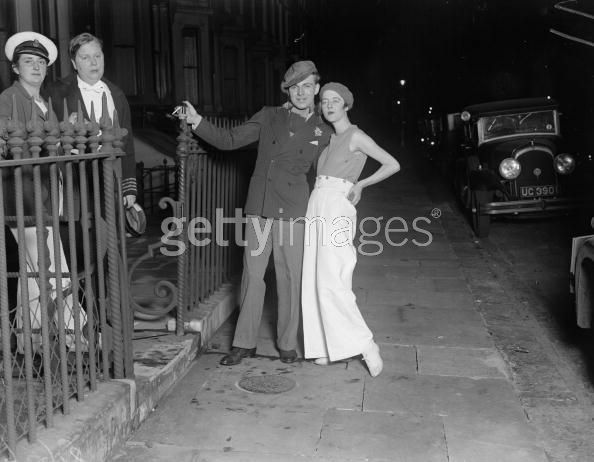 Ashton, though reputedly less wild than many, was part of the Chelsea Bohemian crowd and could number Edward Burra, Barbara Ker-Seymer, Billy Chappell, Marty Mann and Olivia Wyndham among his friends and acquaintances. 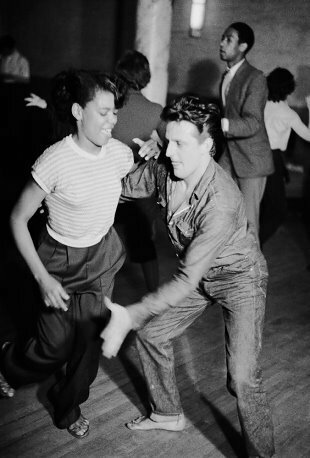 He also danced the Charleston with Brenda Dean Paul and met Brian Howard in Toulon. He, therefore knew a goodly number of Elvira’s party crowd and this is borne out by an anecdote concerning Hugh Wade and, of all people, W.B.Yeats. In 1935, Yeats was entering a final phase of creative energy, supposedly brought on by various rejuvenation treatments. 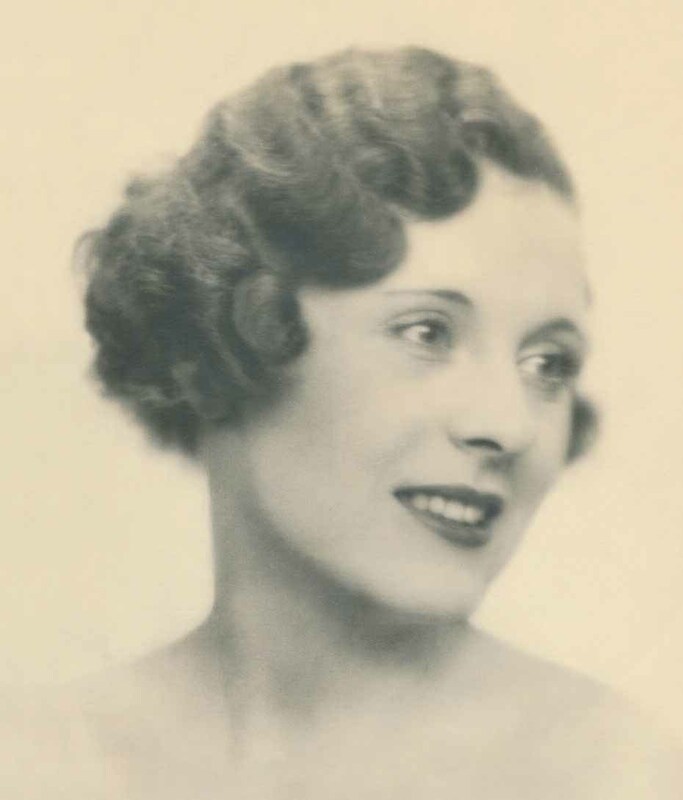 He was also worried about his spoken delivery, and believed Ashton, who had been working with Yeats’ then girlfriend, the actress Margaret Ruddock (aka Margot Collis), could help him. “They belonged for the most part to the raffish fringes of that pseudo-smart Bohemia which was perhaps the most characteristic (and almost certainly the nastiest) social unit of the period.” (Brooke “Private View” (1954) p87) . It also tells us that Elvira’s friend Hugh Armigel Wade, to whom the adjective “epicene” is customarily appended, was known as Hetty to his mates, which I find strangely endearing. If it refers to Hetty King, then it is even better, summing up what Nerina Shute called the “ambisextrous” world they all inhabited. Hetty King was the most talented of the male impersonators that thrived in the last great days of Music Hall. She was particularly popular in World War One and we know that part of Hugh Wade’s repertoire was a medley of sentimental songs from that period, the horrors of which were probably responsible for the whole, and thus reactive, Bright Young culture. 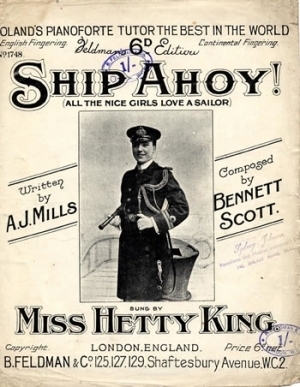 Less seriously, Hetty King’s most famous song was “All The Nice Girls Love A Sailor”, which was to become the inter-war camp equivalent of “It’s Raining Men”. Sailor and Matelot outfits were, unsurprisingly, the most popular “Drop of a Hat” fancy-dress costumes for “Smart Set” parties of the period. 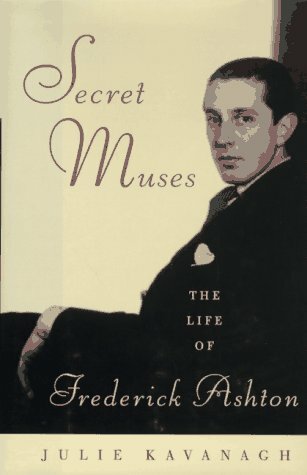 I’ll post more on Frederick Ashton soon, as he seems a likeable fellow and the importance of Ballet and Dance to the Modernism that Elvira’s set embraced has been under-estimated – Diaghilev, Bakst et al being every bit as significant as Eliot and Pound. But a couple of connections/coincidences relating to Yeats are worthy of immediate mention. Yeats’ rejuvenation treatments relied on the quackery of Serge Voronoff (monkey-gland transplants) and Eugen Steinach (vasectomy). 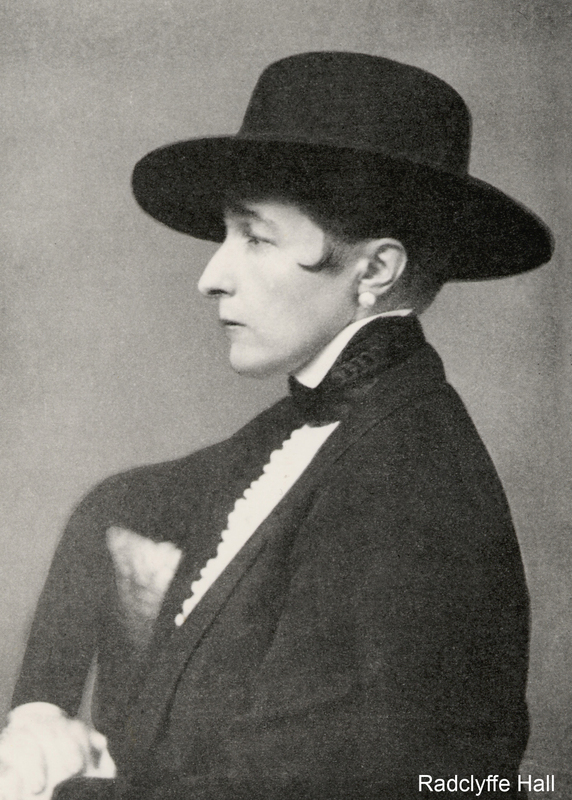 Voronoff had been briefly married to “Jo” Carstairs ‘ mother ( Carstairs was allegedly at the William Mews cocktail party, her girlfriend Ruth Baldwin definitely was). 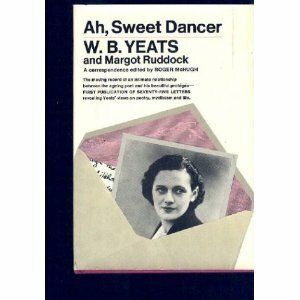 Margot Ruddock, Yeats’ young lover (she was 28, he 69) was a tragic figure – a manic-depressive whose periodic breakdowns culminated in suicide at the age of 44. 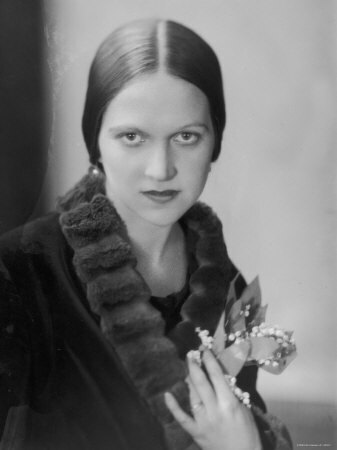 Though a muse and collaborator, her relationship with Yeats was short-lived and she was replaced in the poet’s affection by the usually sensible Ethel Mannin. A horribly neglected author, Mannin’s books (she wrote over a hundred) contain some of the earliest and best analyses of the Bright Young People and, for the time, very frank debates around the issue of female sexuality ( check out Confessions and Impressions or Young In The Twenties). She knew Brian Howard and Nancy Cunard but, though very much a Bohemian, represented a much more politicised and less aristocratic strand than that pertaining to Elvira’s world, with which she would have had little sympathy. Not all elements of Bohemia overlap, much as I would wish it so. To return to Ashton, it says a lot, I think, about the insouciance, arrogance and generational solidarity of the Bright Young People that the lure of the Blue Lantern should be greater than that of the company of the man who was probably the most distinguished and talented poet of the age. I just hope “Hetty” was on form that night.